Ruby red Rooibos tea is famous all over South Africa. 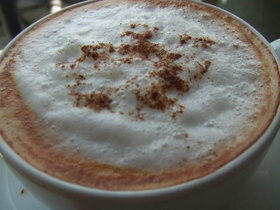 I've developed the most intense love affair with it in the form of a red latte since I've arrived. You can't really see it from this photo, but the bright, feel-good tea is whipped up with some frothy milk and after I sling about five packs of sugar in there, I've created a little hot tea cookie in a cup. Though rooibos has no caffeine, I still get all wired from it (well, that and a fistful of Red Bulls) every morning. It just makes me feel clean and happy and the health benefits abound: it's full of antidioxants that slow the aging process, it boosts immunity and it's been known to help aid with insomnia, irritability, headaches, nervous tension, and hypertension (all MST culprits). Rooibos is very expensive back home at Whole Foods, but here, it's practically a weed--you can buy bags of it at the market for right about nothing. I shall bring many bags home~~I'm pretty stunned that Starbucks hasn't marketed this mama. African Snack Called Chi-Chi: Ever Hard of It? 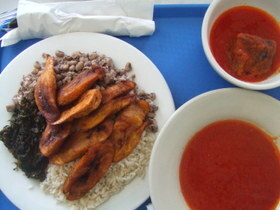 A while back, I was trekking all over the city doing research for an article I was writing about African food. Time and time again, I'd come across this interesting snack in the African grocery stores called Chi-Chi. Now, I'm a big snack girl, especially when it comes to sweets and finally I couldn't take it any longer...so I bought a bag for about a dollar. 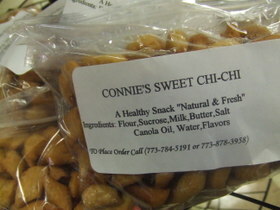 Though there were versions that seem to be more mass produced, the one I purchased was in a little plastic sack with a homemade label on it--looks like somebody named Connie made it. After tasting it, I was so happy that I'd splurged...it was a crispy crunchy little biscuit like treat (they call it natural and healthy...yeah, right) made from nothing that can possibly be good for you (sugar, butter and flour namely). But, it was so good. I've tried doing research about Chi-Chi on line and have found nothing--and I mean absolutely nothing. It was all over the local African/Carib food marts, so I'm wondering why there in no intel about it online. Just another RTW secret, I guess~! The deep South Side of Chicago is the most undiscovered food refuge in the city. It's next to impossible to tell a shack from a sure thing amid the grime and graffiti that lies one hundred blocks from the aristocratic Gold Coast. But once you discover a piece of the pie, man-oh-man...it's as if a whole new food wonderland has opened its crummy doors. One such discovery is a totally off-the-grid eatery called Yassa, 716 E. 79th St. It's one of those joints you either stumble across in a totally random drive-about or are lucky enough to hear about in the whispered circles of in-the-know foodie societies (namely, LTHforum.com). I have been taste testing tons of African food the past few weeks for this new article that appears in this weeks Time Out Chicago magazine. 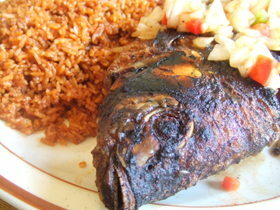 There is so much good food and out of everything I sampled, this charcoal grilled fish at Yassa's reigned supreme. 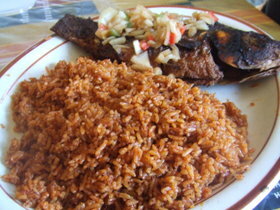 Dive into African eats at this weekend’s Ghanafest, then use our guide to regional specialties to continue your culinary travels. Over the past few weeks I've come across dozens of headlines about the Brangelina juggernaut taking over Africa. A few days ago, this unbelievable quote caught my eye: "If Angelina Jolie gives birth in Namibia, she would have done for our tourism sector what our tourism board budget cannot do in a year," said Namibian Ambassador to the United States Hopelong Iipinge. Wow. So, Brad and Angie's mere presence will cause thousands to trek half way around the world to experience the wilds of Africa, but all of the intricacies of African cuisine won't. Different strokes for different folks, I guess. Do these people think they're gonna actually catch a glimpse of this golden couple? Again, wow.